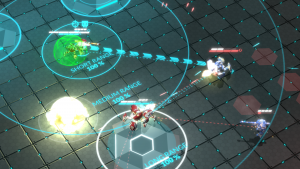 Gladiabots is a robot combat strategy game in which you carefully construct the AI of your robot squad and send them into the battle arena. Improve, refine and repeat until you outsmart all your opponents and friends online. Assemble your perfect team of robots and set their AI strategy with the simple to use but in-depth visual AI editor. Decide when your units should attack, gather resources, support each other, retreat depending on their health, keep their distance, close in, save your shield, react to the circumstances on the battlefield and much more. You are welcome to create an account to contribute to the wiki. This page was last modified on 16 March 2019, at 17:07.